I had known those word were coming in the near future. I had noticed that my son had something growing on his upper lip that was something a little more noticeable than the residue of chocolate milk. 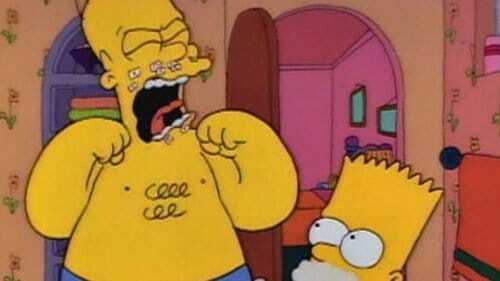 When I helped my son shave for the first time, it wasn’t quite a Simpsons moment, but I probably had a similar expression on my face. Now keep in mind, this is coming from someone who still to this day only needs to shave two or three times a week. And a “full beard” for me looks about like the crumbs on a plate from a couple of cookies. Needless to say, I didn’t need to shave at his age. In fact, I didn’t really need to shave until a couple of weeks ago. Ok, that might be an exaggeration, but not by much. But he did need to shave. And it was starting to bother him. So, a person always does in small town in the South – I went to Wal-Mart. Picked out a razor and foam, brought them home, and . . . stalled. Not sure exactly why. But probably I was delaying that step. That move being a kid to being a (ahem) man. I’m still waiting on this to happen for me, but my son is already to that point. I realize that he’s the same age whether he needs to shave or not. And he’s not any older whether he shaves or not. But the shaving itself seemed so symbolic. So . . . growing up. Way too fast, at least for dad. It was hard to imagine the little kid who could turn a soft, rubber spoon into a lethal weapon, the kid who could find a way to break things in another room without ever actually entering that room, was now going to be armed with a real honest-to-goodness razor. So I stalled. I waited. And I guess, deep down, I hoped it would all just go away. But the only thing that happened was that he continued to need to clean up his face. Then, it finally happened. He said it was time to learn how to shave. So off we went to the bathroom and got started. I didn’t have the heart to tell him that I was probably the last person (well, last adult male) that he would want to teach him the process of shaving – he’d be a lot better off finding someone with a tad more experience. But I was I was the only one around. So get started we did. And we went through all of it – the hot water, the shaving cream, the razor, the basic how-tos. Another milestone of our ongoing journey of growing up. And another reason to be proud of him . . . even if he does have a heavier beard than I do. This is by far one of the sweetest testaments to your son growing into a young man I think I have ever read Mark.